As is typical for the high country, summer has been slow to show itself. The mountains still have a well above average snowpack from our 600+ inch winter, and we received a fresh blanket of snow just last week. This has me daydreaming back to my trip in the tropical weather of the British Virgin Islands this past winter. 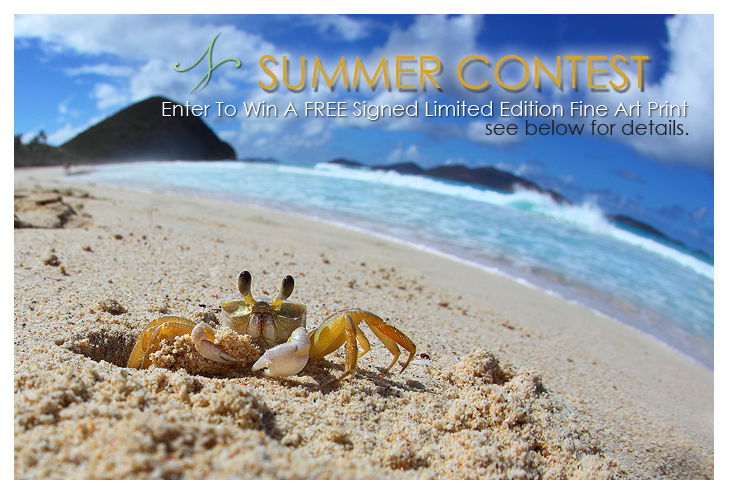 So I thought giving away my favorite and best selling summer photo, "A Crab's World" would be the perfect prize for a new contest. The winner will receive a signed limited edition 8 by 12 print. All you have to do to enter this contest is sign up for Nate's newsletter by filling out this form. Anyone who signs up between now and when the contest ends (in one week), will be eligible to win the print through a random drawing of names. If you recruit a friend to enter, you will both be eligible to win the print. Furthermore, If the friend you recruited ends up being the winner, you will receive a prize as well: a box of art cards. Wildlife or Landscape, it's your choice. There is no limit to how many people you can recruit. Make sure to email us using the contact form to let us know who you are responsible for. Anyone else is welcome to recruit friends as well if they would also like to be eligible for winning the art card box. If you do recruit a friend make sure to send us a message using the contact form to let us know who you are responsible for.